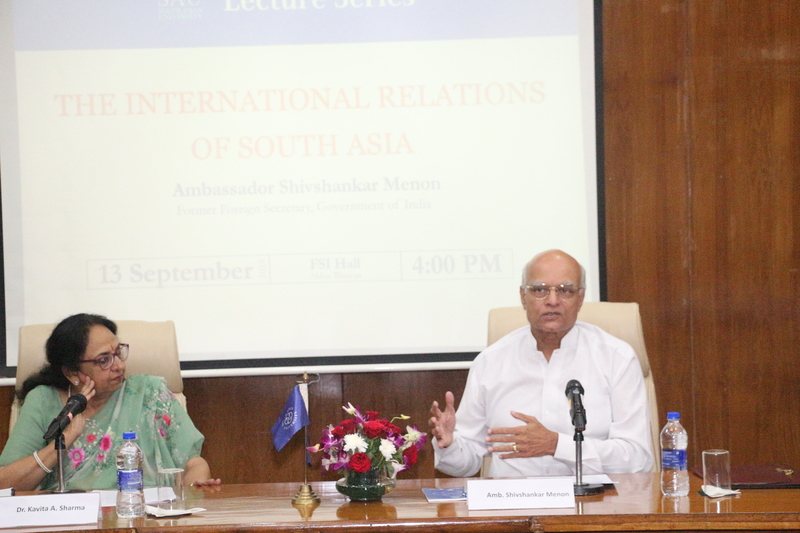 Mr. Shivshankar Menon, India’s former National Security Advisor and Foreign Secretary, delivered the SAU Distinguished Lecture on 13 September 2018, at the Akbar Bhawan Campus in Chanakyapuri. A visiting professor at the Ashoka University, Mr. Menon has been a Fisher Family Fellow at the Kennedy School, Harvard University, and Richard Wilhelm Fellow at MIT in 2015. He was chosen one of the “Top 100 Global Thinkers” by Foreign Policy magazine in 2010. Mr. Menon spoke on the topic ‘The International Relations of South Asia’. The event was chaired by Dr. Kavita A. Sharma, President – SAU. Mr. Menon said that no countries in any other region of the world have such affinity as the ones in South Asia, although the region is the least integrated. Despite a prosperous past, 200 years of colonization changed the region’s economy, geography, literacy, poverty and many other aspects. The South Asian countries have been fighting with one another even as the evolution of nation states and processes of identity formation continue, instead of co-operating among themselves. He argued that, given this context, the foundation of SAARC has been a turning point for the region. Mr. Menon said that the South Asian countries need to be more connected and working together to build their common future. As the nations settle into their identities, a political will is needed for better co-operation. Two and half decades of globalisation has brought a big shift in the pattern of disparity within South Asia. He argued that the destiny and prosperity of these countries are linked and the region needs the world more than ever before. He lauded the idea of the South Asian University and contented that this institution needs to take up a lot of initiative for more co-operations in the interest of the region. The event ended after a lively question and answer session. SAU Distinguished Lecture Series features noted academicians, leaders and experts, heads of important organisations, ambassadors and eminent personalities from various fields of knowledge. The lecture series was initiated in January 2015, with the first lecture delivered by Paula Richman, William H. Danforth Professor of South Asian Religions, Oberlin College, Ohio, USA. In the past, many High Commissioners and Ambassadors of South Asian countries to India, including those of Pakistan, Afghanistan, Bangladesh, Bhutan, Nepal and Sri Lanka have also spoken to the faculty and students of SAU, as part of this series.